PrivacySafe protects your privacy information like photos, movies, contacts of your important person, and IDs like a user name and passwords stored in your iPhone and iPod, from someone’s stealing and sneaking a look or your losing the devices. Once you stored your privacy information into “PrivacySafe”, the information has protected by Safe’s lock codes and file lock codes. 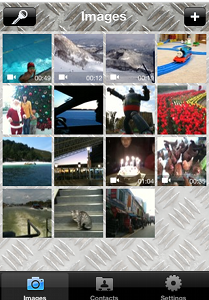 You can preview stored photos and movies in “PrivacySafe” . 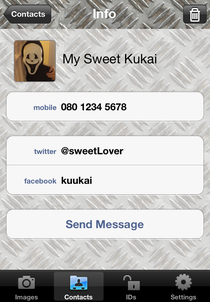 You can also make a call and send a mail to stored contacts as same as default “Contacts App”. You can keep ID infomation like a user name/number and passwords in “PrivacySafe”. You can also kick the login site by “PrivacySafe”. When you replace your device, you can restore the information in your previous device by entering same file lock codes. You can return privacy information from “PrivacySafe” to default application like a “Photo App” or “Contacts App” or export to PC whenever you want. Unlock direction video is here. 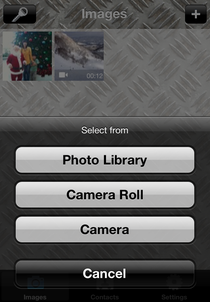 Press “+” button in the Images tab in “PrivacySafe”, you can choose photos or movies from camera roll or Photo Library. *In this case, “PrivacySafe” will “copy” the data (not “move”) because of iOS’s restriction. So you have to delete the photos and movies remained in the “Photo App”. When you don’t need to protect the information, press a trash button on the preview screen of the “PrivacySafe” and choose a “Delete from this device” or “Move to Photo Library”. Press “+” button in the Images tab in “PrivacySafe” and select camera, you can take a photo or movie. 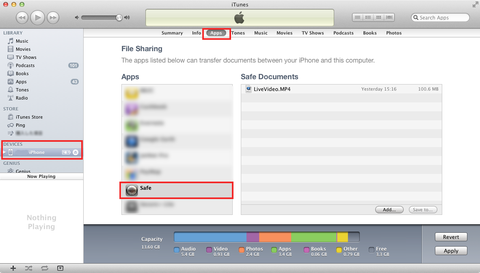 Captured photos and movies are stored in “PrivacySafe”. Press “+” button in the Contact tab in “PrivacySafe” and select a contact from stored in “Contacts App”, The contact information will “move” to “PrivacySafe”. When you don’t need to protect the information, press a trash button on the preview screen of the “PrivacySafe” and choose a “Delete from this device” or “Move to Contacts”. 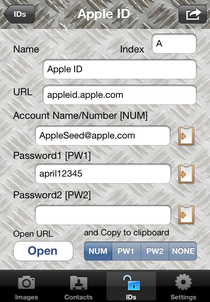 Press “+” button in the IDs tabl in “PrivacySafe” and you can add new ID information. If you press “Open” button, the web site of the URL will be opened and NUM/PW1/PW2/None (selected in the right selector button) are also stored to clipboard. You can paste Account Name/ Password1/ Password2 into the clipboard by touching a paste board located on the right of the item. You can import photo (jpeg only) and movie via iTunes. After connecting your device with your PC, you start iTunes on the PC and select your device on the iTunes. You can import the file by drag-and-dropping at Safe Documents field, which you can see “Apps” tab – “File Sharing” – “PrivacySafe”. On your device, you select the file from “PrivacySafe”-”Setting”-”Import Photo/Movie file”. Then the file will be moved to “PrivacySafe”. When you don’t need to protect the information, press a trash button on the preview screen of the “PrivacySafe” and choose a “Delete from this device” or “Export to PC (via iTunes)”. (1)Touch mode : you can rotate the dial by dragging the dial. 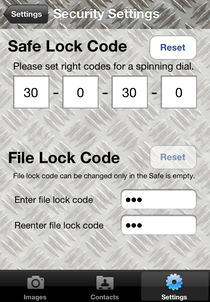 When you change the direction of the rotation, the dial number will be entered as unlock code. After you enter 4 codes, You should push a “Push to Unlock” button. When the 4 codes mathes with your setting, “PrivacySafe” will open. (2)Accelerometer mode: by inclining your device, you can turn the dial. 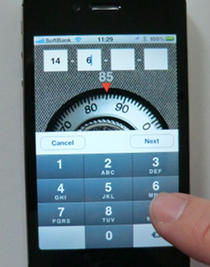 You can enter the codes by changing the direction of the dial rotation as same as “Touch mode”. When you use this mode, try to keep your device vertically and rotate the dial. (3)Ten-key mode: by entering codes using the ten-key. 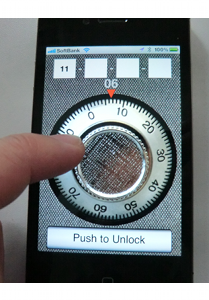 By touching unlock code field, the ten-key will be displayed on the screen. After you enter 4 unlock codes using the ten-key, you should “Set” button. File lock codes can be changed only when the “PrivacySafe” is empty. The software is provided “as is”, without warranty of any kind.